When was the last time you scolded yourself for not spending enough time with your kids? Or freaked out because you were serving frozen chicken nuggets yet again? Or dreamed of keeping a clean house, while tripping over discarded Lego bits and piles of grass-stained laundry. If you’re like most moms, you probably heap this guilt upon yourself on a daily basis – feeling bad about not being a good enough mom. Not to make you feel worse, but all this guilt can be totally debilitating and turn you into the kind of mom no one wants to be around. This, according to parenting guru and psychotherapist Alyson Schafer, is why we must kick guilt to the curb. This unrealistic longing for perfection is forcing us to trade in our own desires for the demands of our kids. We swap stilettos for sweatpants and dinner parties for play dates in order to live up to the Angelina Jolies of the world. She seems to have it together, so what the hell is wrong with me? 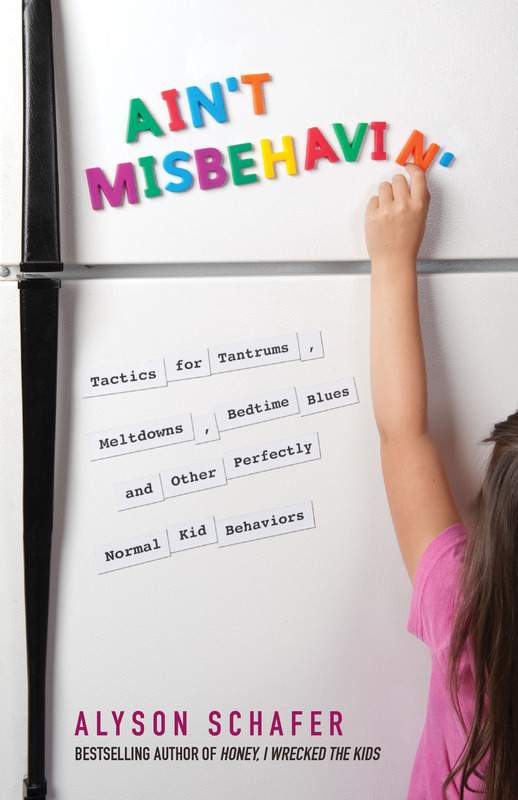 To help moms cope with these feelings of incompetence, Schafer has penned three books, including her bestseller Breaking The Good Mom Myth: Every Modern Mom’s Guide to Getting Past Perfection, Regaining Sanity, and Raising Great Kids and her newly released parenting manual, Ain’t Misbehavin’. We caught up with Schafer for her take on how to kick the guilt habit. So, what’s wrong with a mom giving up self-care to do for her kids? You would never ask an operating room doctor to work 24/7 without time-off to refuel. Just like doctors and nurses and teachers, mothers need to take time for themselves or else they become ineffective as parents and they shut down. And we’re so strongly connected to our kids that our exhaustion and unhappiness becomes contagious. Studies have shown that infants develop a form of depression when moms get depressed postpartum. Kids are much better off when they have well-rested parents and they learn from our actions to be self-respecting human beings. For starters, I strongly believe in education. Before having a baby most moms-to-be take a prenatal class of some sort. But when we sign up for a parenting class, others assume there must be something wrong with our parenting. I have people in my parenting boot camp workshops saying, ‘My friends want to know why I’m taking this class – they think I’m a great mom.’ Sadly, there is still a stigma associated with parenting classes. Somehow we’re all just expected to know how to be good parents without any training. That’s not reality. The best thing you’ll get from a class or a mother’s group is the sense that you’re not alone in how you’re feeling –it will normalize the whole experience of motherhood for you. So, if I take a class I can become a perfect mother? What a disservice you’d be doing to your kids if you were a perfect mom. What child would want to come from a perfect mother? When she grows up to become a mother herself, the only way for her to go will be downhill. There is no way she can live up to your standards and so you’ll just be setting her up for failure. Besides, perfection is a constructed ideal – we’re all just humble humans trying to get by. For some reason, everyone always thinks self-care has to be exercise or yoga – which is certainly not everyone’s formula. So we start feeling guilty about that too. Not only am I a terrible mother but now I’m also not exercising or meditating or doing Pilates. I’m failing at self-care, too! Instead, you must find your own version of self-care. There is something that each one of us does that we could do indefinitely and always feel good. This may be cooking, gardening, sun bathing, reading or shopping. You know you’ve found this ‘thing’ when you’re doing it and you blink and suddenly three hours have passed. You’re getting energy, not expending it. It shouldn’t feel like hard work. For me, it’s going to a matinee movie with a big tub of popcorn. That has nothing to do with flax seed oil or hot yoga. But how will this help me as a mom? What I’ve found is self-care helps lengthen a mom’s fuse. So, the next time your toddler refuses to get dressed in the morning, you won’t immediately lose it because you’re exhausted and over-worked and sick of parenting, instead you’ll have more patience to deal with the situation and diffuse a potential meltdown. You’ll have fewer incidents of losing it that you won’t have to feel guilty about later. Guilt can be thought of as the good intentions we don’t intend to keep. By feeling guilty we allow ourselves to maintain our superior ‘good mother’ status without having to actually change our behaviour. No matter if you clean your house or don’t clean your house, get rid of the guilt. If you have no time, then that’s a legitimate reason not to clean; but if you think being busy is not an excuse to have a messy house, then clean the house! Either way, you don’t have to feel guilty. Guilt is a psychological game we play to keep our ego in tact. But, it’s not actually doing us any good.